I picked up a Ms. Pacman in pretty good shape. They told me the game board does not work anymore but they weren't sure. The Marquee lights up, but the monitor only makes a buzzing sound, I do not see any light on the game board when the cabinet is on. Can someone check out this short video clip and see if you can give me an idea of what the problem might be? Holy crap, that thing looks great! How much did they milk you for? First things first, of course, would be to make sure all the fuses are good. Replacing that fuse block is pretty common from what I've seen. lol, you tell me, I think I got lucky. I got it for $250, as you see on video, it has a buzzing sound when is on, but you cannot see anything on the screen. I'm not familiar wiuth Pac-man boards, but for example, on a 60 in 1 I see the green light when is on, on this one, I do not see anything. I would love to make it work and keep everything original. Could you tell me exactly where is the fuse block and how to check which ones are bad? thanks to everyone for the information. I'll post if I'm successful. I checked the fuse block but am not sure how to tell if fuses need to be replaced, I'll buy them anyway and try them. one thing, can someone tell me exactly what fuses does this cabinet uses? they also say 250V and 312, not sure what 312 means. not sure what 312 means. Per this datasheet, 312 is a fast-blow series of fuses. Pg 14 of the manual here shows and lists the fuse holders and fuses. To tell which fuse goes where, use pgs 2-3 (or 4-5?) of the schematic here. For example, there is a 2A 250V slow-blow fuse (P/N 0017-00003-0004 on pg 14 of the manual) between the power plug and the on/off switch on pg 3 (or pg 5?) of the schematic, upper left corner. Went to lowes, got myself a kit with a bunch fuses and the testing meter "thing", I believe I tested all the fuses that were inside ms.pacmanand believe they're all good ( green light blinked ), only the 1 Amp fuse seems to be bad. Offcoarse my luck, the kit doesn't bring 1Amp fuses, what should I do? Go buy a 1 Amp fuse? Or try with a 5 Amp? Honestly, I'd just replace them all. Fuses are cheap. what should I do? Go buy a 1 Amp fuse? Or try with a 5 Amp? DO NOT use a 5A fuse in place of a 1A fuse. The purpose of a fuse is to limit the amount of current that a circuit can draw in case of a malfunction. These are one-way substitutions that will likely result in blowing fuses more often. Going the other direction (higher amp, lower voltage, slower blow-time) defeats the purpose of having a fuse by increasing the odds of an electrical fire or damage to the circuits. It's much cheaper (and easier and safer) to replace a blown fuse than repair a burned-up PCB trace or replace burnt-out components. 2. Buy some spares -- especially the type that is currently blown. on the sticker next to the 4 fuses it says the AMP for each fuse but also says 12 volts for the 1 AMP fuses and 7 Volts for the 5 AMP fuses. The fuses I got at Radio Shack, are the exact AMP but they're all 250 Volts, is this probably the reason why the monitor is still not powering up? picture attached of te fuse block. What I'm doing right now is using a Pac to Jamma adapter I got from arcadeshop to install a 60 in 1 board to be able to use the wiring already in there, I get sounds and game seems to work, the only think I do not get is picture on the monitor, can someone tell me, if I need to give power to the monitor separately? or does monitor get power from the original harness? This is going to sound harsh, but you really need to learn some basic electronics if you are going to mess with this anymore. ProTip: The fuses in the first picture look to me to be all bound for the game board and have nothing to do with the monitor. I say that without looking at the game schematics. Because a monitor is going to pull 110V. Knowing that is a prerequisite to messing around with things that can hurt you or further break components. 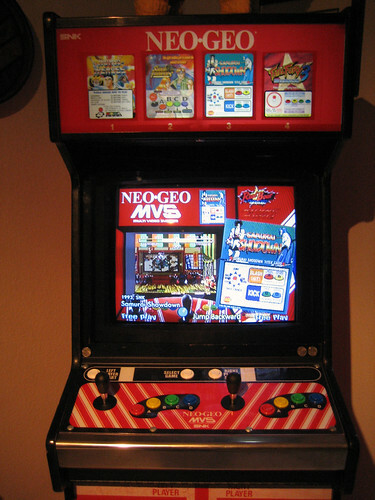 Or you can gut the whole cabinet and just wire for JAMMA with a 60-in-1 with an LCD or PC monitor. There isn't any shame in that and the electronics knowledge required is akin to hooking up a stereo. you are completely correct, I should know the basics of electronics to be able to bring this thing back alive, since I do not have the knowledge, time to learn it, the 60 in 1 Jamma idea sounds great to me. I'm not crazy about keeping the original components, I love the cabinet and the game, could care less about the old monitor, non-working board and all wiring inside. gutting everything, getting rid of monitor, sending board for repair, then sell it, and installing a 60 in 1, will hide all the other games, except for Ms. Pac-man. I already had the 60 in 1 connected with an adapter to be able to use the already existing wiring, so I'm good. I would love to make it work and keep everything original. You seem determined to go the, put in an LCD and 60 + 1 route, so I don't have much to offer you. But I will say this, all you probably need to do is repair the chassis to keep using the original monitor. It could be something as simple as a cap kit, maybe a fly back, but all it takes is time. And some know how, but even that's pretty easy to do if you just follow along videos you can find online. I mean, I've done plenty of fly backs and cap kits, and I started from not even knowing how to solder. Please sell the crt monitor and all internals to an arcade collector who will use them to restore classic arcade games..
You will do better just selling the board broken then you will sending it for repair and then trying to sell it. That thing looks to be in pretty great shape. My suggestion is to sell the entire thing to someone who will keep it whole if you are going to do a LCD and 60-1. You should be able to get more than you paid for it and you can grab another gutted generic cab that needs some TLC for $40 bucks off Craigslist or whatever. Alternatively, if you want to learn more, do your 60-1 project in another cab so you can learn how to fix the Ms. Pac. and once you have the knowledge to fix it up - biggity-bam - two arcade cabs.